Both Federal and Missouri law prohibit employers from discriminating against their employees and prospective employees based on their age. Under the Missouri Human Rights Act, it is an unlawful practice to refuse to hire or to discharge employees because they are aged between forty and seventy. Further, employers may not limit, segregate or classify an employee on the basis of being aged between forty and seventy. Employers may not compensate employees differently, apply different terms or conditions of employment, or grant preferential treatment on the basis of age unless there is either a bona fide seniority or merit system in place. The Federal Age Discrimination in Employment Act bans the same type of conduct but has no upper cap on the protected class as all employees aged forty or above, working for a company with twenty or more employees, are protected. The ADEA also bans harassment of an individual on the basis of their age. Find out when you should hire an employee rights attorney. Many decisions that an employer makes may seem to be age-neutral on their face, but have a discriminatory effect on those aged over forty. Likewise, some decisions that limit opportunities for those over forty may be legitimate business decisions that are not illegal. 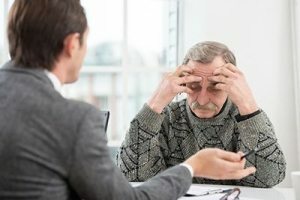 If you find yourself fired due to your age, you may immediately want to hire an age discrimination lawyer and file suit. However, you must weigh your options carefully. Age discrimination lawsuits are different than a number of other discrimination lawsuits. These types of cases are often difficult to win. There are a few reasons for this. First, employers can fire workers for a number of justifiable reasons. As an older worker, it is easy for employers to find a reasonable factor other than age or a bona fide occupational qualification to fire you for. For example, if a younger worker has education or training that you do not then your employer may be technically justified in firing you and holding on to the younger worker. Or you may be seen as a liability to continually operate machinery in a safe manner and laid off for someone younger. See also details about wrongful termination lawyers for more informaton. Just because age discrimination cases can be hard to win does not mean you shouldn’t fight. If you have faced discrimination due to your age, you need to get in touch with an age discrimination lawyer today. If you’re in need of an age discrimination lawyer in Kansas City, we hope you’ll contact us. Here at Paulus Law Firm, we strive to be the best age discrimination lawyers in Kansas City. If you are dealing with any issue involving potential age discrimination, please reach out today. We are here to help. If you find yourself being discriminated because of your age and need of a FREE consultation from a certified age discrimination lawyer, please contact Paulus Law Firm at (816) 237-8502 for a free consultation.